Our firm represents foreign nationals in obtaining lawful permanent resident status, a status which allows a person to live and work in the United States indefinitely (Green Card). We are able to quickly navigate through complicated factual scenarios in the permanent residency process and obtain successful results. We handle all family based petitions, as well as employment and business based petitions, including applications for labor certifications before the U.S. Department of Labor, and employment petitions for foreign workers. We provide representation in all family based avenues of immigration. We provide representation in all employment based avenues of immigration. Our firm represents foreign nationals in obtaining lawful permanent resident status through business investments. The investor in this category is required to be involved in the management of the new commercial enterprise, meaning he or she must either be involved in the day-to-day managerial control of the commercial enterprise or manage it through policy formulation. Under the Regional Center Pilot Program the investor is allowed to meet the criteria of the 10-minimum job creation through the establishment of indirect employment if he or she invests in a “designated” regional center that promotes economic growth or creates jobs. A regional center is “any economic unit, public or private, which is involved with the promotion of economic growth, including increased export sales, improved regional productivity, job creation, and increased domestic capital investment.” If the regional center or individual commercial enterprise is in a targeted employment area, the capital investment is reduced to $500,000. A targeted employment area is an area that, at the time of the investment, is a rural area or an area that has experienced unemployment of at least 150 percent of the national average. Immigration under this category involves a two-step process. If approved, the initial investment petition leads to a grant of conditional permanent resident status. Within the 90 day period immediately preceding the second anniversary of admission as a conditional resident, another petition must be filed to remove the conditional aspect of the residency. This is done to prove that the required investment was made or is still sustained and that the requisite 10 full-time jobs were created or will be created within a reasonable time. Whether you are in the United States or in your home country, our firm can help you apply for your lawful permanent resident status. 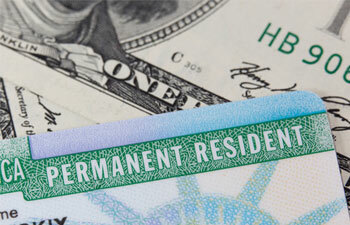 If you are in the United States, and you have an approved family or employment based petition, you may be eligible to apply for your permanent resident status without having to return to your home country through the process of “adjustment of status.” Otherwise, if you are in your home country, we represent foreign nationals before the U.S. consulates all over the world and may help you in obtaining an immigrant visa through the U.S. consulate in your country. Adjustment of Status is the vehicle by which a person who is already present in the United States may apply to become a lawful permanent resident without having to return to their native country to apply for an immigrant visa at the United States consulate. In general, to be eligible for adjustment of status, a person must be admissible to the United States and must have had a lawful entry into the United States, continuous lawful immigration status, and no prior unauthorized employment. There are two important qualifications to this general rule, however: Immediate Relative Family Based Immigrant Petitions and Applications under INA § 245(i). Immediate Relatives: Spouses and Children (under age 21 and unmarried) of U.S. citizens, and Parents of U.S. citizens over age 21 who entered into the United States legally may apply for adjustment of status even if they have fallen out of legal status, overstayed status, or worked without authorization. INA § 245(i): A person may apply for adjustment of status through a family or employment based petition, notwithstanding prior unlawful entry, unlawful status, or unauthorized employment, if an immigrant petition or labor certification was properly filed on their behalf on or before April 30, 2001 and the petition was approvable when filed. This is called “245(i) grandfathering.” It does not matter if the grandfathering petition was ultimately revoked, withdrawn, or denied so long as it was approvable at the time it was filed on or before April 30, 2001. For petitions filed after January 14, 1998, through April 30, 2001, there is an additional requirement that the person must have been physically present in the United States on December 21, 2000 (this physical presence rule does not apply to derivative beneficiaries). Subject to some exceptions, a person applying for adjustment of status under § 245(i) must pay a $1,000.00 surcharge (sometimes called a penalty fee) in addition to all other filing fees.